Unburden* Raises Speed if a held item is used. This Pokemon's Speed rises one level when it uses or loses its held item. 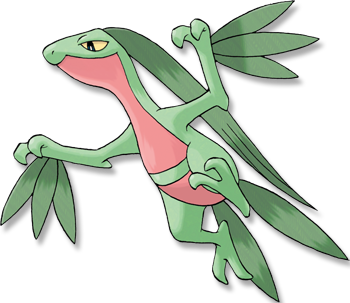 Emerald Leaves grow out of this POK�MON�s body. They help obscure a GROVYLE from the eyes of its enemies while it is in a thickly overgrown forest. Leaf Green Its strongly developed thigh muscles give it astounding agility and jumping performance. Diamond/Pearl It lives in dense jungles. While closing in on its prey, it leaps from branch to branch. Platinum It lives in dense jungles. While closing in on its prey, it leaps from branch to branch. Heart Gold It leaps from tree branch to tree branch quite swiftly. It shows astounding agility. Soul Silver It leaps from tree branch to tree branch quite swiftly. It shows astounding agility. Black It lives in dense jungles. While closing in on its prey, it leaps from branch to branch. White It lives in dense jungles. While closing in on its prey, it leaps from branch to branch.